The Dalton-Whitfield Solid Waste Authority provides a Special Event Recycling service using an Away From Home trailer and Clear Stream recycling containers. It’s all part of a state wide campaign called Recycle 4 Georgia. 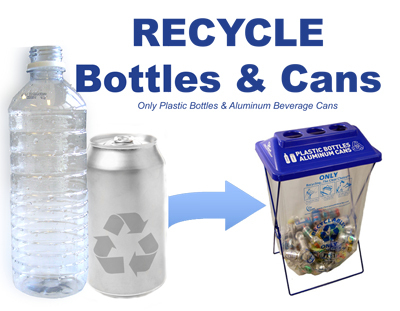 Recyclables collected include plastic bottles with the #1 or #2 recycling symbol and aluminum beverage cans. To request recycling containers, instructions for container setup, and pickup of supplies and recyclables after your event fill out the Special Event Recycling Request Form below, or call the Materials Recovery Facility at 706-278-5001. Click the picture above to Download and Print the mini poster "Recycle Bottles & Cans" and post on or near the Away From Home Containers. Please enter the contact information for the individual requesting the Away From Home Special Event Recycling bins. Please include a short description of the event, date, and time. Enter the address / location for this event. Please describe the event the bins will be used at. For example, a sporting event, camp, church gathering, etc. Please enter the date and time the Away From Home bin trailer can be dropped off. Please enter the time you would like the bins to be delivered. Deliveries are typically between 9 am and 3 pm Monday to Friday. Thank you for requesting Special Event Recycling bins. We will consider your request and e-mail or call you back to finalize the details.